There are plenty of treatments and remedies to treat an algae problem in your aquarium, however to have a constant 'man on the ground' or to be more precise, an algae eating fish is a great idea. There a few different types of fish that eat algae and will help to keep your tank clean and healthy. For more information, advice and ideas about fish keeping visit the Swell UK Blog, which is packed with features. An algae eater may start to eat your precious plants once the algae supply has diminished, so have a separate tank on stand-by for when he is not needed. Supplementing his diet with algae tablets should help stop him from destroying cultivated aquatic plants. Well known bottom dwellers, most catfish will much away quite happily on algae. 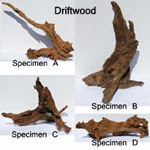 Twig catfish are so called because they live on driftwood or plants and camouflage easily into their surroundings. Brown in colour, they can grow to around 10-20cm in size. Supplement the diet with spirulina tablets regularly to make sure that he has enough to eat and protect your plants. This type of catfish does not live happily with aggressive fish such as Cichlids or Barbs, as it has a delicate nature. These South-American Catfish are wonderful algae eaters. With a sucker type mouth and rough lips, they aren't the prettiest of creatures, however they will eat large quantities of algae. They have a brown mottled skin, and large head, they can grow to 10-15cm, with larger species such as the Hypostomus Plecostomus reaching maybe 60cm in a big tank. Often novice fish keepers do not realise that they have bought a juvenile, and soon have an enormous Pleco dominating their tank. Chat to your local dealer for the right species for you. Provide these fish with a rock shelter, as they sleep during the day. They can be eager feeders, and have been known to eat smaller, live fish if they cross their path. A common choice, the Siamese Algae Eater is the choice most fish keepers opt for. Striking, slim fish, they can grow to almost 14cm in length. Identify the fish by a black stripe running from nose to tail, if the stripe is a pale gold, it is likely to be the Flying Fox. They are very quick swimmers and can jump easily, so a tank with a hood is a good idea. They feed on brush and thread algae, and will quickly feed off ornaments, glass and plants too. They are territorial fish, so limit the number to no more than 5, depending on the size of your tank. Snails are also a great addition to your tank. They love to eat algae and will slowly but surely work their way around the aquarium eating the algae from glass, plants and more. Growing to just 2cm in size, these hardy little snails will dig under the gravel or substrate to eat algae remnants. They will eat algae from plants during the night, but prefer to keep themselves tucked away in the substrate during the day. These snails do not like a dirty habitat, and will retreat up the sides of the glass if they are unhappy with their living conditions. These black and yellow shelled snails are a pretty and useful addition to any tank. They love to eat green spot and beard algae. They grow to around 3cm in size, so take up little room, however they can produce hundreds of little eggs, which can be a nuisance to remove. Watch the pH level of the aquarium, as Nerites like a pH level above 7 to stay healthy. Also, it's best not to add these helpful scavengers to a tank with Loaches or Cichlids, as they make ideal prey! To keep algae at bay in the first place, keep on top of regular water changes and treat the water accordingly. A little algae is fine, especially if you have a dedicated fish or snail to help clear the problem. However it can quickly become a real problem, so keep an eye on phosphates and nitrate levels and treat accordingly.